Hog Roast Livingston – Repeat Customer! Hog Roast Livingston is proud to have plenty of repeat customers who love our tasty food and professional service with a smile. One of our customers, Ainsley, booked us in last year for a milestone celebration – her daughter’s 21st birthday party – and it was a great success. The time, Ainsley booked us in to cater her eldest daughter’s post-wedding party at her house, with our Menu 3 featuring a sumptuous centrepiece hog roast that we would cook for hours and hours until perfectly juicy and tender on the inside and crispy and crunchy on the outside. The 70 guests would be in for a real treat! We don’t just serve pigs, however, even though it’s part of our name. While Hog Roast Livingston is renowned for our amazing hog roasts, we also cook spit-roasted meat, and we can cater with a barbecue or help you to devise a menu with several courses and even provide canapés and drinks served by waiters if needed. We have a popular Southern Slow Roast menu too, where you get to choose three meats and four sides, so that different tastes are catered for, and there’s even a vegetarian option. 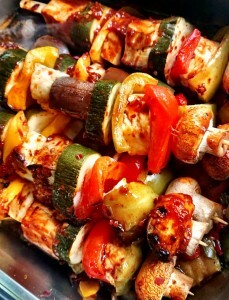 For Ainsley’s daughter’s post-wedding meal, we were also asked to grill veggie skewers as an alternative to the hog. With chunky pieces of halloumi cheese and fresh vegetables like mushrooms, peppers, red onion, courgette and tomatoes, they always tend to go down well with vegetarian guests and can even be made vegan by leaving out the halloumi. On the day of the party, Hog Roast Livingston arrived at the private home venue hours before the food service. We set up our gazebo and serving tables and got cracking with preparing the hog, as it would need to slowly sizzle for ages before having a rest, and then being carved up to satisfy the guests’ hunger. We served the lovely food on wooden crockery on this day and were paid plenty of compliments about this and, of course, the food itself. Not only was the hog stripped clean, but the veggie skewers were devoured with relish too, so everyone invited enjoyed their food on this day.